Cars and trucks. Trucks and cars. These have been the two main interests for my kids for the past 3 years. So, let me tell you, after years of trucks and cars, I am openly thrilled that we now are exploring the world of dinosaurs. I had never really paid much attention to them, to be quite honest. But as a newly initiated mom, let me just say: dinosaurs are so. cool. What I love about this book is that it works for my 5 year old but is also pretty darn interesting for me too. There are 4 chapters: Small, Big, Giant, and Gigantic. (Gigantic! So. Cool.) The illustrations of the dinosaurs are wonderfully real and fill out the pages. My favorite feature is the snapshot of how big each dinosaur is compared to a human being. It’s hard to believe the size of these beasties. 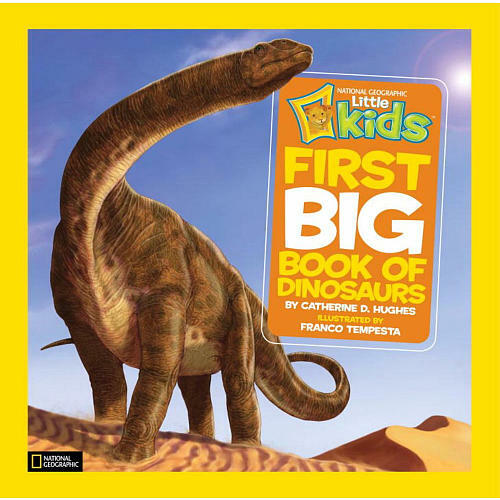 My son wanted to start at the beginning of the book and read it start to finish, but I had to interrupt a few minutes in to at least just get a glimpse of a Gigantic dinosaur (Brachiosaurus! Awesome!) This book would easily take an hour for an adult to read aloud word-for-word. There are basic facts about each dinosaur including what it ate and when it lived. My son enjoyed the map that includes which continent each dinosaur’s fossils have been found on. So. cool. This entry was posted in children's books and tagged dinosaurs on October 10, 2013 by skylikeme.